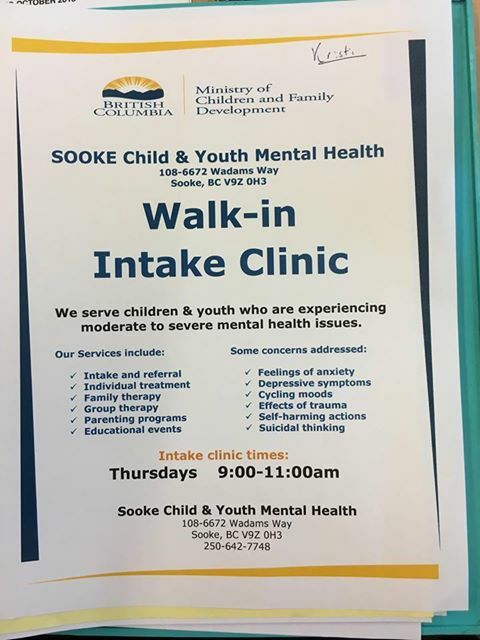 Updated: A Sooke-specific walk-in intake clinic is available, see the poster below! “With school in full swing, midterms over and the holiday season on the horizon, December makes sense as a time for parents to check in with their children to see how things are going,” said Wade Maybie, a registered nurse at the Child and Youth Mental Health (CYMH) Clinic in Saanich. 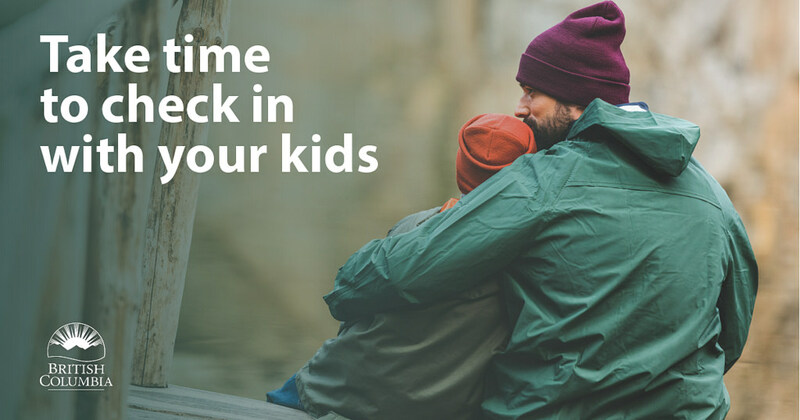 British Columbia parents may not know that there are 100 walk-in intake clinics around the province, funded by the Ministry of Children and Family Development, where children and youth who may be struggling with mental-health challenges can get assessed and connected to supports and services. Sooke: Sooke Child & Youth Mental Health – 108-6672 Wadams Way, Thursdays 9:00 a.m. – 11:00 a.m.
Westshore: 2nd floor – 345 Wale Rd., Victoria, V9B 6X2, Tuesday 9:00 a.m. – 12:00 noon, Thursday 12:00 noon – 3:00 p.m.
Victoria: 302-2955 Jutland Rd., Victoria, BC V8W 9S3, Tuesday 9:00 a.m. – 12:00 noon, Thursday 12:00 noon – 3:00 p.m.
“Ten years ago, we might have had about 200 referrals annually. 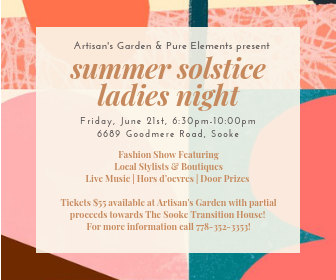 Seven years ago, that number rose to over 300, and now that number is approaching 500 each year just at the Saanich clinic,” said Maybie. And while that increase may seem concerning, it comes with a positive effect as well. “It may have to do with the lessening of stigma associated with mental health so that more families are willing to seek help,” Maybie said. Anxiety, depression, obsessive compulsive disorder, emotional dysregulation, family conflict and trauma, self-harm and problems related to alcohol and drugs are common issues for the children and youth who come into the CYMH clinics. The Saanich team, like the others throughout the province, sees pre-schoolers, school-aged children and youth up to 18 years of age who are experiencing significant mental-health issues. In Greater Victoria, there are clinics at Westshore, Saanich and Victoria, as well as through Aboriginal Child and Youth Mental Health. Maybie says it’s best to call ahead to be sure you are within the clinic’s catchment area. That’s true for all clinics in B.C. “Sometimes it’s possible that what the caller really needs is a referral to a different community resource, and once the initial screening meeting occurs, the team looks at the best fit for services,” Maybie said. According to Maybie, the effects of trauma on a child and family are now better understood. Helping children or youth learn to soothe their heightened nervous system and build strong attachments with key adults provide a greater sense of well-being. This can be done by drawing together the key adults in a child’s life and building a common understanding and skills that address and ease the child’s reactive fear responses. This often helps them focus better at school and at home, act out less, build more stable friendships and keep families more intact. Within the provincial mandate, Maybie says CYMH has a special focus on early childhood intervention (for children aged up to six years), providing parents/caregivers with opportunities for insight regarding their child’s development and attachment needs. Organizations like the Peninsula Youth Clinic in Sidney (open Thursday evenings) and Foundry in downtown Victoria provide services to young people aged 12 to 24 years who are living with mental-health and substance-use challenges within a safe and judgment-free environment where they can feel comfortable asking for help and accessing the services they need. The Saanich team has nine staff, including a master’s-level social worker, a nurse, a psychiatrist, three psychologists, and three master’s-level clinicians with degrees in counselling psychology and other related disciplines. Find a CYMH clinic in B.C. Note, this type of article will be available exclusively to subscribers starting in January, 2019. Join us in December and become a Charter member … and receive the Trial Rate for a full year. At most, you’ll pay $0.33/day.